Far from home, port and any legal protections, fishers on Thai owned or flagged fishing vessels are often forced to work in dangerous conditions for extremely long hours with little or no pay. There is an all too obvious connection between these dire working conditions and illegal, unreported and unregulated fishing (IUU) activities. This is the challenge facing policy makers – how can you regulate those brokers, captains and fleet owners who actively operate outside the regulations? Only structural reform can fix this dire situation. And that reform can only come about from on-the-ground organising, international pressure and industry reform. What is needed are supply chain agreements, collective bargaining agreements, vessel codes of conduct and other enforceable agreements that improve the pay, benefits, working conditions, health and safety of fishers in the region. To lay the groundwork for these much-needed conditions, the ITF started building the FRN, a democratic sustainable union of fishers across Thailand and the region that can press for structural reform wherever it is needed, along with added weight from global pressure. 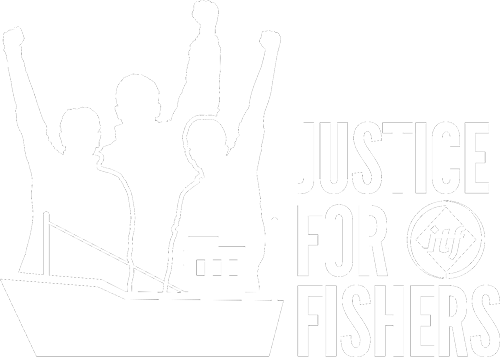 Clear action by national, international and industry authorities and employers, based on the coordinated and clear demands by organised fishers is what the Fishers Rights Network is aiming to achieve. Once on board, fishers face brutal working conditions, long hours, verbal and physical abuse including beatings and sometimes killings. Onshore and at sea, these workers have very few places to turn for help because they have little knowledge of their rights, they mistrust the Royal Thai Government (RTG) and its officers, and also have to deal with corrupt officials helping labour brokers operate with impunity. The network of NGOs and service providers from civil society, who are trusted by and help fishers in Thai ports, play a very important role, but it’s widely recognised that their resources and capacity are limited, and their efforts alone are not enough to halt the exploitation. For migrant fishers to have a voice on their boats, in the fishing ports and as a part of the debate on how to end forced labor in the fishing industry, they must have the right to freedom of association and collective bargaining. Put simply, they should be allowed under Thai law to establish labour unions of their own choosing, elect their own leaders, represent their members’ interests, and collect membership fees to pool their resources and defend their rights. To monitor and expose violations requires a sustained effort and that won’t happen without migrants’ own organisations. We continue to build our network across Thailand, Myanmar and Cambodia, establishing a fishers union with a strong Asian regional presence. We continue to develop the structure to refer cases to NGOs and partners, to notify authorities, to get justice for fishers. We continue to build our power in order to be in a position to negotiate supply chain and collective bargaining agreements, instigate necessary government action and advocate for structural reforms that will benefit fishers and raise standards in the industry. Our actions in the region, coupled with international pressure, buyer and consumer awareness, and other trade union solidarity can lead to real change for fishers in this industry.